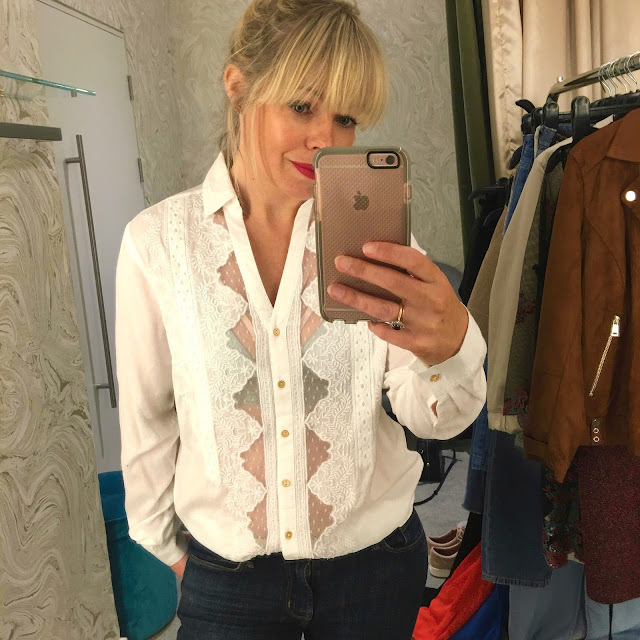 Style Theory: River Island has evolved, no longer just for the teens and early twenty year olds, it has some really fantastic classic and edgy fashion pieces for us 30/40/50/60 year olds. They excel in denim, I always find some beautiful blouses and their underwear is gorgeous. I popped into the River Island Style Studios in River Island on Oxford Street to have a browse. They have a lovely space in which you can privately, comfortably try on loads of fab pieces, some really talented stylists to help you find some key looks, you just need to book and it is all complimentary...absolutely worth a visit.. 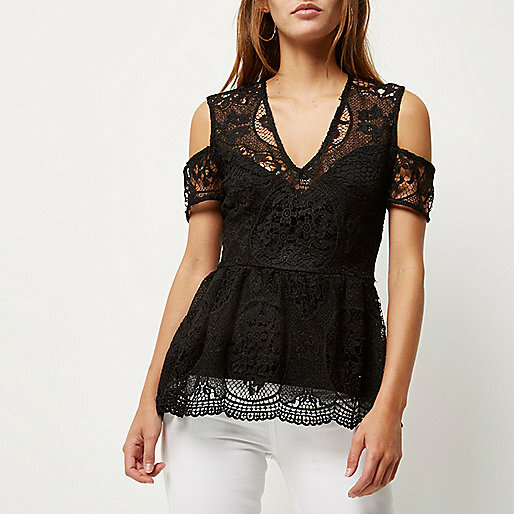 This shirt is beautiful on, I love the sheer panel at the front, shows a little but not too much! It looks great with the RI lingerie just seen underneath, amazing price for a gorgeous bra and super comfortable on. The jeans above tick all the boxes for me, they are comfortable, very this season with a step hem and look as good with trainers are they do with heels. 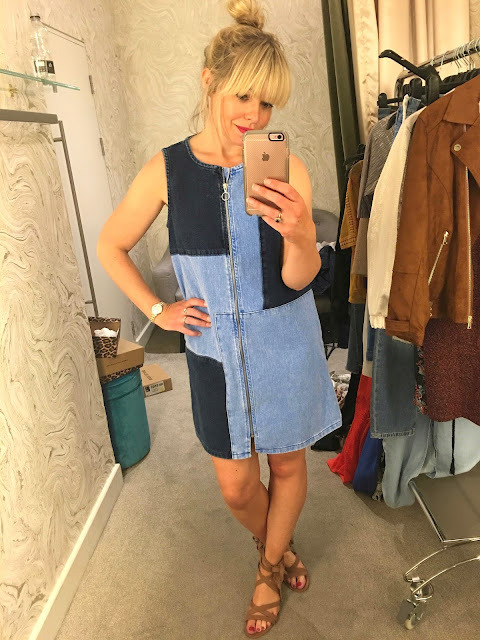 The sandals are incredibly comfortable, flattering on the ankle and with a block heel easy to walk in..
A surprise hit, this denim dress is gorgeous on, it is a heavyweight denim so skims over all lumps and bumps and will be fab in the summer with white pumps. The patchwork details gives it an edge and the length is flattering. This is a fab little skirt and will look great in the summer with the tie up sandals and a white tee, for now I styled it over a fine metallic dress for a dressed up but comfortable look. Love the layered look and I adore the long waistcoat/coat below, it looks so amazing with the skirt but unfortunately had sold out in store.. 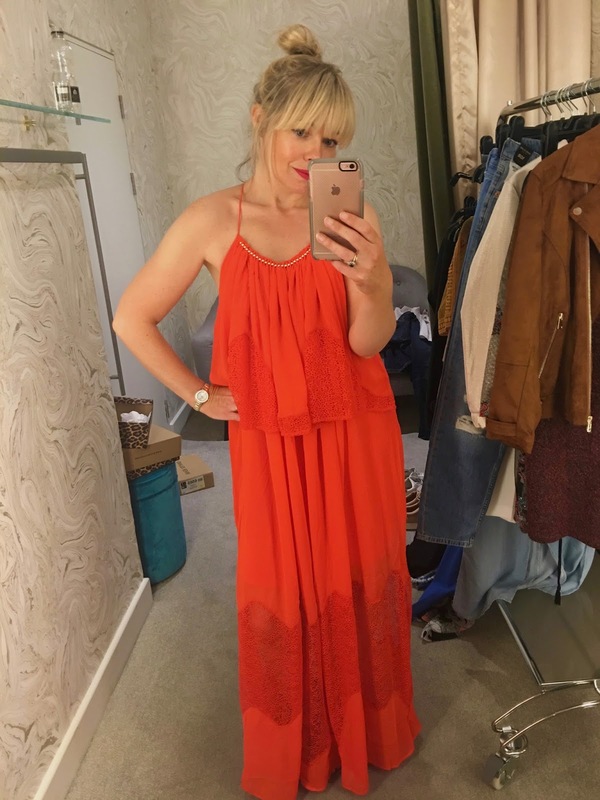 I really wanted this maxi dress to work, the colour is stunning and it would look amazing on someone taller than me (I am 5ft3...just!) The panel at the bottom in see through so it lightens the overall maxi-ness of the dress. It does come up a little big so if you are in between sizes size down. This is fairly out there but I saw it a while ago and just had to try it on, for a wedding it would look amazing with gold heels and a cream blouse or cream silk camisole top...Love love it. I was so surprised by how many fab pieces caught my eye and I loved having a good look through the store to find those eye catching things that would suit me, funnily enough I seemed to choose almost all RI studio, at the top end of RI prices but the designs, cuts and fabrics really stood out, I guess that is why I was drawn to them. So plenty on my shopping list from River Island, I have started by buying the pink tie sandals, they were too comfortable and flattering not to buy!